In Statutory Domain and the Commercial Law of Intellectual Property, John Duffy and Richard Hynes argue that IP exhaustion — the doctrine that limits a patentee’s or copyright holder’s control over goods in the stream of commerce — was created and functions exclusively to confine IP law within its own domain and prevent it from displacing other laws. In this essay, we explain why we are not persuaded. A central theme in Duffy and Haynes work is the argument that the common law did not play a role in the emergence and development of exhaustion. However, we show that the evidence they offer is inconclusive, incomplete, and at times inaccurate. Close examination of early exhaustion cases paints a more complex picture that cannot be squared with the idea that exhaustion was created independently of common law principles. Next, we explain how the approach Duffy and Hynes advocate would strip exhaustion of any normative content. While we agree that exhaustion draws a line between the domain of IP law and other laws and thus prevents the former from displacing the latter, the placement of that line is far from arbitrary, and has always reflected policy considerations. 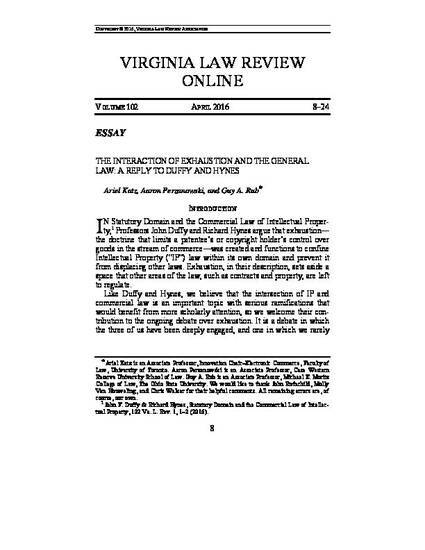 Finally, we note that Duffy and Hynes’ theory oversimplifies the relationship between IP law and state law, partly because it does not fully consider federal preemption.